James Whitney was born in 1921, in Pasadena, California, and lived all his life in the Los Angeles area. He studied painting, and travelled in England before World War II. James completed seven short films over four decades and collaborated with his brother John for some of his film work. The first of the brothers' films was “Twenty-Four Variations on an Original Theme”. Its structure was influenced by Schoenberg's serial principles. James and John created their series of “Five Film Exercises” between 1943 and 1944, for which they won a prize for best sound at the 1949 Brussels Experimental Film Competition. In 1946, the brothers travelled to San Francisco Museum of Art to show their films at the first of ten annual "Art in Cinema" festivals. 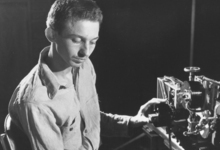 James spent 3 years working on the 8mm film “Variations on a Circle” (1942), which lasts some 20 minutes. Then, he became more involved in spiritual interests such as Jungian psychology, alchemy, yoga, Tao, and Krishnamurti. These interests heavily influenced his later work. Between 1950 and 1955, “Yantra” was produced entirely by hand. By punching grid patterns in 5" by 7" cards with a pin, James was able to paint through these pinholes onto other 5" x 7" cards, to create images of rich complexity and give the finished work a very dynamic and flowing motion. Analogue computer equipment developed by brother John, allowed James to complete “Lapis” (1965) in two years, when it might have taken seven years otherwise. He drew dot patterns again for this film, but the camera was positioned using computer control, allowing each image to be overlaid from multiple angles. In this piece, smaller circles oscillate in and out in a kaleidoscopic array of colours, accompanied by Indian sitar music. The patterns become hypnotic and trance inducing. The two following films “Dwija” (1973) and “Wu Ming” (1977) intended to form a quartet with the two last ones: “Kang Jing Xiang” and “Li”, which remained incomplete when James died in 1982.